When it comes to school, I’m a bit of a perfectionist. I never used to be this way until college. And now, alas, it is my curse. So, when I get a bad grade (keep in mind, a bad grade in my sick little world is anything below an A-), I want to know that I at least deserved it. Instead, I am stuck with a dreaded ‘B’ in a class that I can only begin to describe as the worst college experience of my life. Not only was the teacher inexperienced– something that can be understandable if they at least admit their novice position– but she also clearly wasn’t well versed in the subject at hand. A major part of the class, and an aspect she graded us on, was so beyond her ability that she asked another professor to come in and teach class for a couple of days. Now, call me crazy, but I don’t want this same woman who has already admitted her ineptitude in a field to be grading me on that same field. Her tendency to play favorites was also beyond obvious. We all have favorites– favorite friends, favorite neighbors, favorite relatives. That’s normal and acceptable. However, it is incredibly unacceptable and unprofessional for a professor to act on this favoritism. Before I explain this specific situation, let me backtrack a few years and explain why I so hate when teachers blatantly favor one student over another. It was 10th grade, English class. I was loud, talkative, and, I’m willing to admit, a bit annoying. Therefore, my teacher did not like me. Understandable. What was not understandable was my inability to get above an 84 on an essay. I wasn’t the best writer, but I was convinced some of my work was worthy of at least a B+. And yet, like clockwork, my essays came back with the dreaded ’84’ on top. Somewhere half way through the semester I started going to my father for help. Gradually, as my grade refused to change, his corrections became more and more intense. Finally, for one of the last essays of the semester, my father practically wrote my paper. Don’t get me wrong, I don’t approve of parents during their kid’s homework, but this was just ridiculous. And, once again, I got an 84. Now let me explain a few things to you. My father is a pretty smart guy, and I’m not just saying that as his daughter. He’s a partner in a law firm. He went to Yale. And, ironically enough, his was an English major. And yet, according to my teacher, his essay was only worthy of an 84 in a 10th grade English class. Well, I gave up on that futile fight. As I mentioned, grades were less important to me back then. However, ever since then, I’ve had a special hatred of favoritism by teachers (I think this is a good point to mention that I graduated from High School with the superlative “Teacher’s Pet”– I had learned to play the system, but still didn’t approve of it). Now, this inept professor also showed favoritism as extreme as my 10th grade English teacher. When handing back tests one day, she said to one girl that she was “shocked” and “disappointed.” I myself had gotten a similar grade, but did not receive such a comment. Was she simply not shocked at my having done poorly? Did she expect as much from me? And this was only a couple of weeks into the semester. We had gotten no other grades in the class by which she could judge are scholasticism. Later, she had a conversation with this same girl about how people like “them” had a “hard time” and more was expected of them because of their genius. At this point, I would like to call shenanigans. You see, my teacher was far from a genius. As previously mentioned, she didn’t even understand the subject she was teaching. I am also 99% sure that I got points taken off an essay because I didn’t have time to send her a copy of my rough draft to look over. 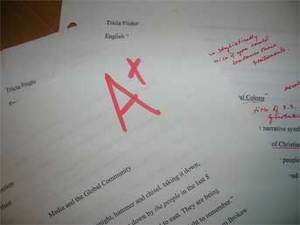 Instead, my friend who was doing a different essay and had sent in her rough draft, sent me the corrections on hers so I could gauge the corrections I would have to make on my own. Apparently that wasn’t good enough. So what if I put in hours upon hours of work. It was a damn good essay, but not to her. To be perfectly honest, and I swear this isn’t just some low blow, but I’m pretty sure the reason I got points off (though she would never admit to it) is because I used B-I-G words. Oh. Dear. God. What has this world come to? So yes, I’m peeved. I got a B, which isn’t horrible, but the fact remains that I got it in a class where no actual learning/teaching was done. All the classes got out a half hour early, and most of them had us “doing group work” when we really didn’t have any “group work” to speak of. If I get a B, I want to have deserved the B. Instead, I had the misfortune of getting a B from a professor who I am completely unable to respect. Listen, the simple truth of it all is that some people are just naturally great teachers, some people can learn to be great teachers, and then some people have no freaking clue what they’re doing and should get out of the field as soon as possible before they anger another group of students (oh yes, there are multiple students who have expressed similar discontent) and lower their GPA (right before graduation, thanks for that). Can you guess which category my teacher fell in? And now to enjoy a very merry winter break filled with emails and phone calls as I attempt to repeal my grade and ultimately challenge the authority of this professor. Oh joyous occasions.